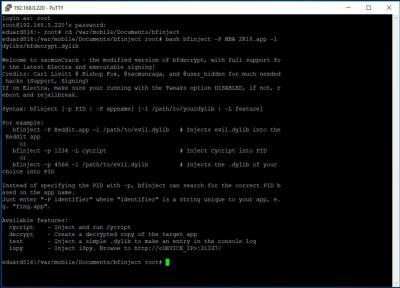 eny clue why Bfinject files- latest for 11.1.1-2 cant decrypt larger Apps ? higher then 200 MB, they all fail in procees while decrypting. Apps should be resigned with proper entitlement. I tried this, but I have the same problem (I used ldid2 instead of ldid). This is version 2.5.2 of the app that is a 64 bit app. Ermm guy, is there a way to use sacmun bfinject version to work on iOS 11.3.1? it works with tweak mode on. Could you be more specific please. I'm using sacmun's bfinjecto and it doesn't work for me with Tweak mode on. About that fork, where do I put the plrun file? Thank you so much. I'm getting this error, do you know what is it about? EDIT: Do you know what is this error about? Guys, can someone support me? I have still 30 apps I'd like to install on my iPad Pro 12.9 with iOS 11.3.1 + Electra. ... please do not reply me back to buy the app, I know I can buy it, but this website is not for this purpose (as I do understand, but correct me if I'm wrong). Thank you it works now . 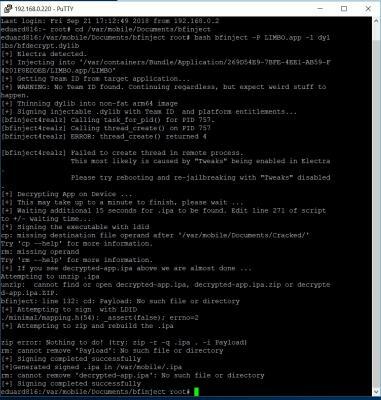 Do I need to delete previous cracked IPA everytime I need to decrypt? 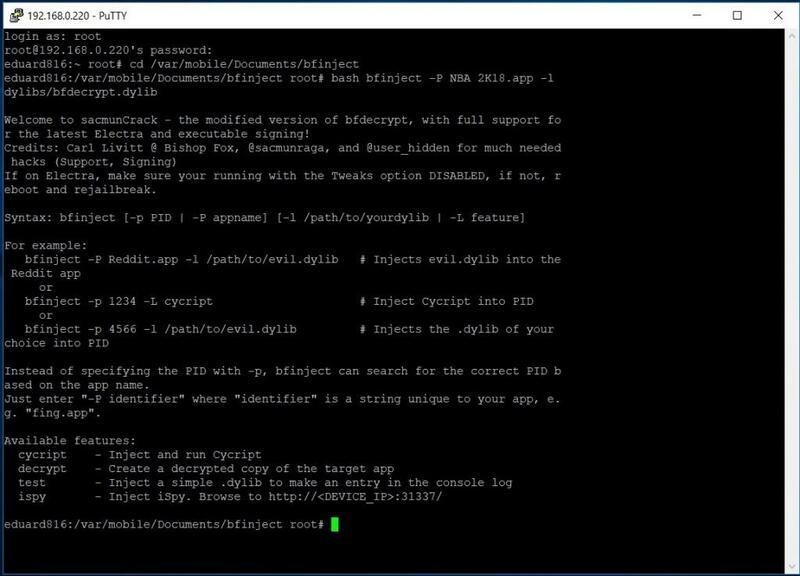 to install cracked apps Just use Cydia Impactor. this is a thread for "how to crack apps" NOT "how to resign apps"
I have tried a different app. 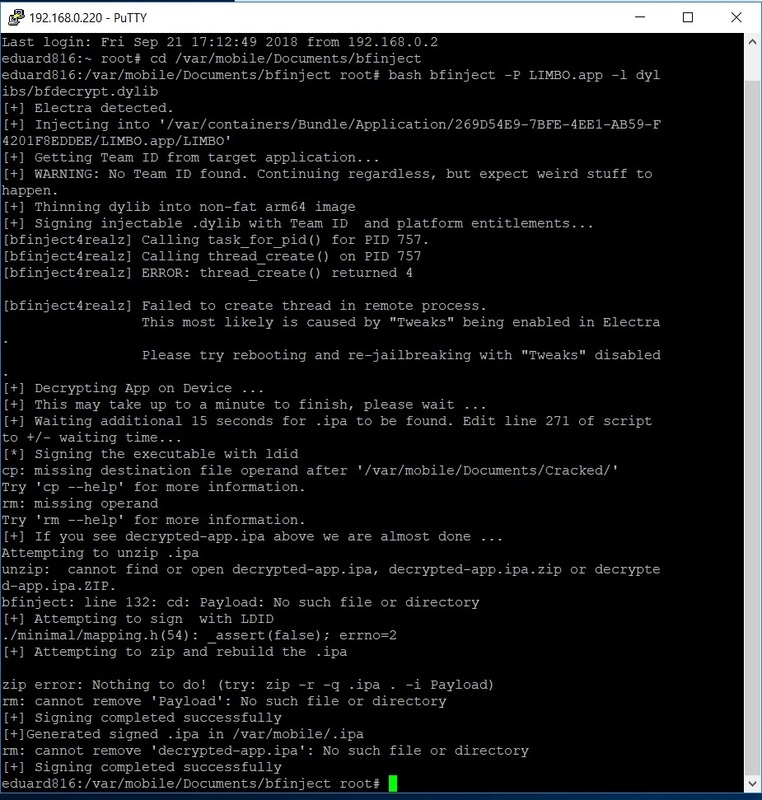 Using Limbo App, the app is currently running and run the bash command, and got this error message.